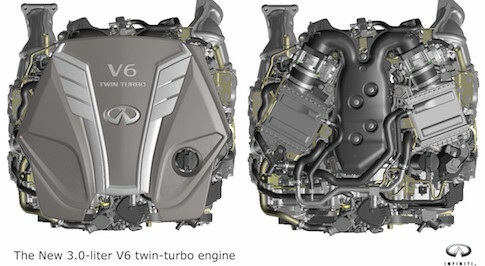 Infiniti has revealed a new 3.0litre V6 Twin Turbo engine, dubbed the most advanced V6 for Infiniti. The new compact and lightweight engine strikes an ideal balance between driveability, efficiency and performance. The result of lighter and more compact cylinder blocks, the weight and size reduction of the engine makes for greater mechanical efficiency, while a series of new features and in-house innovations secure superior performance. Selected Infiniti models will be equipped with the all-new 3.0-litre V6 twin-turbo from 2016 onwards, with the engine available in two performance levels  300 or 400 horsepower. Both engines share the same technologies and offer the same unrivalled sensation of potent and immediate power delivery.